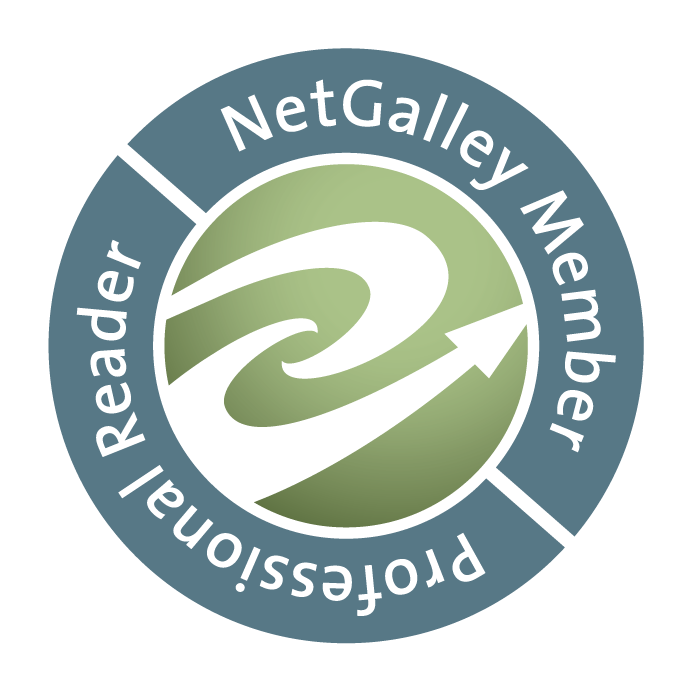 Visit Alyson Beecher on Wednesdays for Non-Fiction Picture Books at Kidlit Frenzy. 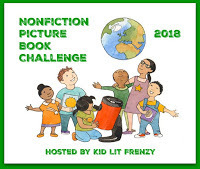 From her post and others, you will discover and want to celebrate terrific nonfiction picture books! I've had this book for a while, just had not read it yet, but now, wow! 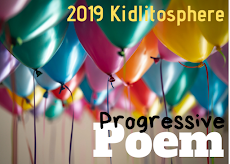 It is the 2019 Orbus Pictus Award Winner, announced this past week at the NCTE convention. I am not a big football fan, have never heard of Ernie Barnes the NFL player but I now know I've seen the paintings of Ernie Barnes, the artist, possibly because of seeing art with a student years ago, who wanted to paint sports heroes. I am no longer sure of the name, but I remember the brilliant full-of-action work of Ernie's paintings. Now I know some of his story, too, from this book by Sandra Neil Wallace. 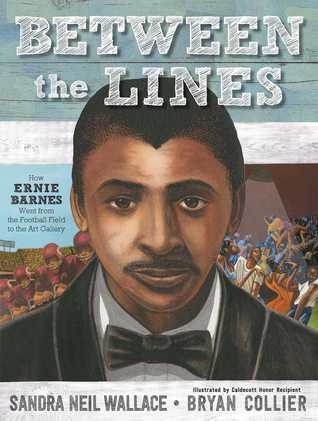 Ernie Barnes grew up in North Carolina, loved to draw, and even drew in the mud when he was young. He carried a sketchbook everywhere. In his home in the segregated south, no one told him how to make a living as an artist, but a note at the back said a weight-lifting coach discovered him and made him an athlete. He became a football star, earned scholarships to college, eventually ending in the NFL. One review says that his "work has influenced a generation of painters and illustrators and can be found in museums and collections, such as the African American Museum in Philadelphia and the California African American Museum." One thing I loved in this story is that Ernie's parents, while in the south kept from many public places like art museums, knew that the arts were important and that Ernie wanted to be an artist. His mother took him to work with her some days so he could see the art in the home of a wealthy lawyer where she worked. There are others who gave him courage to continue doing art like his art teacher, even a coach who kept fining him when caught sketching during football games (thus he kept going anyway)! In the final game of 1964, a rainy clash, Ernie was newly inspired when the field turned to mud. "Painting mud." He finally decided to give up football and quit. It was a courageous act which left him broke until he presented himself to a meeting of the team owners, asking them to hire him as the official artist of the American Football League. His brilliant idea worked; he was soon exhibiting and selling his work in New York galleries, the success achieved from those early days of drawing in mud. This picture book includes pieces of artwork created by Ernie in a combination of watercolor and collage. Along with the imaginative illustrations, Ernie's art still stood out. There is additional information at the back, including a picture of Ernie's first painting which he never sold, The Bench, now hanging in the Pro Football Hall of Fame in Canton, Ohio. This book is listed as one of those "recommended" by the Orbus Pictus Award committee. Like the NASA scientists yesterday, November 26th celebrating a Mars landing, long ago two men took a risk to do something extraordinary, go into the deep, deep, deep of the ocean to see what was there, something no one else had done. This story shows the growing up years of Otis Barton and Will Beebe, curious boys, then men who took risks in various ways, but ended in their curiosity about the deep sea. With Barton, the younger, tried hard to contact Beebe, already a famous explorer. Finally they got together and created the 5,000-pound bathysphere, making history in 1930 with their initial 800-foot dive. Barb Rosenstock shares some of the hundreds of details needing to be solved, including how two tall men could fit themselves into a bolted-shut globe “the size of a tiny closet.” It's also fun as well as impressive to read Katherine Roy's note of how she created the illustrations, using her husband and some cardboard, figuring out the way bodies might look in that tiny space in order to illustrate it. As the descent occurs, the crew above halts progress to check the bathysphere’s cables. “300 feet. Stop. / ‘We’re leaking!’ Otis cried. 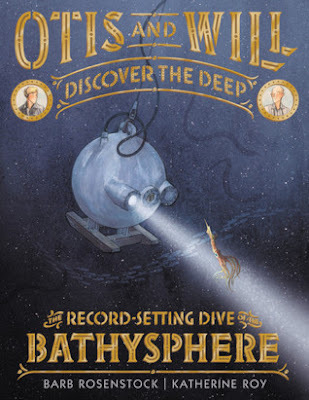 A trickle seeped through the hatch door….Would a tiny leak stop?” At 800 feet, their deepest on the first dive, a double gatefold opens to the bathysphere, dwarfed by the expanse of ink-blue sea, its searchlight illuminating thick schools of fish, squid, and jellies. It's an amazing imaginative look at what they saw, the first ever to be there! Roy’s multimedia paintings work on different levels from growing up pages to events aboard the ship and then under the sea. She created the endpapers, to show creatures that dwell at several different ocean depths. Diversity is part of her additions; some people of color and one woman are included. Rosenstock and Roy’s collaboration celebrates scientific teamwork and an exciting first in deep-sea exploration. Added at the back: an author’s note, illustrator’s note, historical note, and sources used.